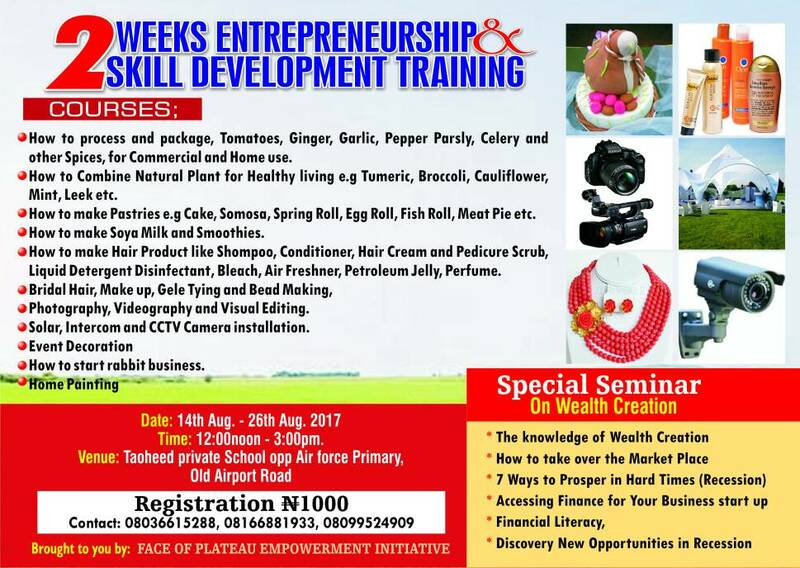 Participate will be trained to foster better-informed skill acquisition and produce more creative and well thought-out service that will result in better offering to the consumer. ° How to process and package, Tomatoes, Ginger, Garlic, Pepper Parsly, Celery and other Spices, for commercial and home use. ° How to Combine Natural Plant for Healthy living E.g Tumeric, Broccoli, Cauliflower, Mint, Leek etc. ° How to make Pastries e.g Cake, Somosa, Spring Roll, Egg Roll, Fish Roll, Meat Pie, Soya Milk, Smoothie and Event Decoration etc. ° How to make Hair Product like Shompoo, Conditioner, Hair Cream and Pedicure Scrub, Liquid Detergent Disinfectant, Bleach, Air Fresher, Petroleum Jelly, Perfume. ° Bridal Hair, Make up, Gele Tying and Bead Making. ° Photography, Videography and Visual Editing. ° Solar, Intercom and CCTV Camera installation. ° How to start rabbit business. °Discovery New Opportunities in Recession and way to succeed. Taoheed Private School, behind. Air force base Old Airport Road, Jos, Plateau state.